The billions of marine life killed by Once Through Cooling (OTC) in PG&E’s Diablo Canyon Nuclear Power Plant (DCNPP) is staggering and represents threats to commercial and sport fisheries, near shore ocean ecosystems, local fishing industries, and coastal economies. Change is necessary at DCNPP for the health of California coastal waters and communities in San Luis Obispo County. The “ethnosphere,” a term coined by Wade Davis, National Geographic Explorer-in-Residence, is defined as “The sum total of all thoughts, dreams, ideas, beliefs, myths, intuitions, and inspirations brought into being by the human imagination since the dawn of consciousness. It’s a symbol of all that we’ve accomplished and all that we can accomplish.” (Utne.com – Tales of the Ethnosphere). For the Chumash in general and for the local northern Chumash, Yak Tityu Tityu, this includes their relationship with ocean, land, coast and their belief and experience that all life and that which supports life are sacred. Before the Spanish conquest, the Chumash were martilocal fishers, hunters and gatherers living along the coast and 40 miles inland between Malibu (a Chumash word) to Ragged Point in villages sometimes numbering a thousand or more inhabitants. Between 3000 to 1000 years ago they lived as far north as Kirk Creek, if not further to the Esselen. Today, the Chumash are found throughout their former lands as well as up and down the West Coast. Did you know that all those scenic rocks off the California Coast are part of a National Monument? The California Coastal National Monument (CCNM) includes more than 20,000 small islands, rocks, exposed reefs, and pinnacles above mean high tide within a corridor of 12 nautical miles (13.8 land miles) from the mainland along the entire California coastline, from Mexico to Oregon, 1,100 miles. In fact, this national monument is perhaps the most viewed, but least recognized national monument. Important ocean areas can become a National Marine Sanctuary or a Marine National Monument for the preservation and sustainability of the vital ecosystems and oceanographic features. Otherwise, man’s destructive activities can destroy such vital areas. 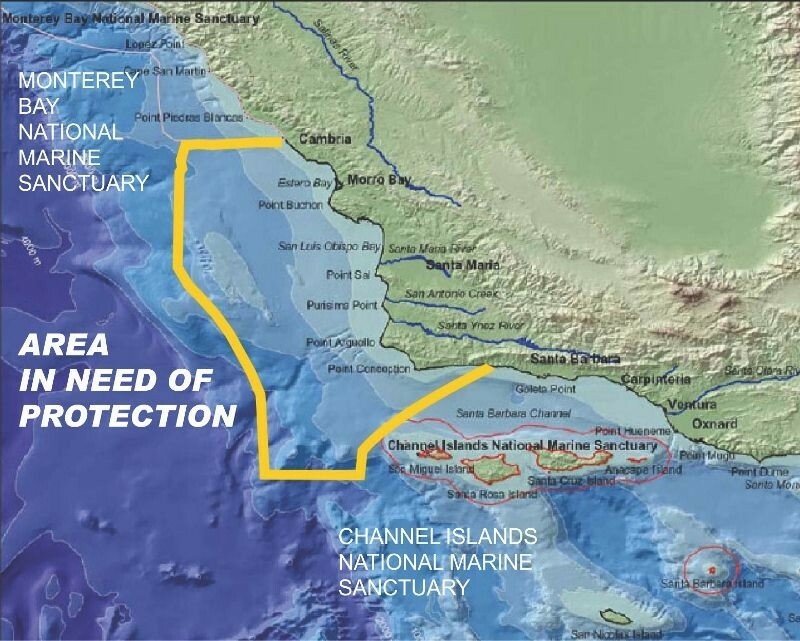 Between the Channel Islands and the Monterey Bay National Marine Sanctuaries lies such an area, known as “Core Area One” in the “Proposed Central Coast National Marine Sanctuary, 1990” document. PG&E’s Diablo Canyon Nuclear Power Plant (DCNPP) is mankind’s attempt to assume that engineering can eliminate any possibility of a seismically induced accident. However, improbable is not impossible, as earthquakes are unpredictable. “Now, as Japan struggles to contain four out-of-control reactors, all of us—whatever our views of nuclear energy—must focus not on assurances that it can’t happen here, but rather on ensuring it never does,” Joel R. Reynolds, senior attorney and director of the Southern California program of the Natural Resources Defense Council. We depend on public agencies to provide and protect clean drinking water. Yet California agriculture rarely controls their water pollution. If not now, when will agriculture stop polluting our ground water, rivers, lakes, and ocean? Agricultural water pollution threatens our drinking water, our seafood, marine life and habitat, our fishing industry, and our water recreation. Freshwater is precious, yet we manage freshwater by promoting one-time use, then divert the used water to the ocean, often polluting our ocean and beaches. When it rains, we use gutters and hard surfaces to rush the water to the ocean, often causing flooding, instead of directing run-off to natural watersheds and water storage containers. When water is scarce, we seek to purchase more from other cities, and we think of building a desalination plant. We can do better. We can have more freshwater and cleaner oceans and beaches. We need to understand how to better manage freshwater and wastewater. Microcystin, a potent liver toxin produced by freshwater bacteria, is entering the ocean and polluting the nearshore ecosystem, resulting in the deaths of at least 21 southern California sea otters. It also poses a health threat to humans. Microcystin poisoning can cause adverse effects in fish, animals, and humans. Having the best possible water quality needs to be our community goal as we rely on a healthy ocean and streams for recreation and food supply. Water quality in Morro Bay and other coastal communities is increasingly threatened by pollution from excessive man-made nutrients and other contaminants from farm and urban runoff and wastewater, as reported by the San Luis Obispo Science and Ecosystem Alliance (SLOSEA). Our coastal veiwsheds offer magnificent views and vistas that are enjoyed by millions of visitors. The following are internationally and nationally significant features, some that are seen, and others that are unseen, hidden below the surface in the nearshore environment between Point San Luis and Santa rosa Creek. Our coastal veiwsheds offer magnificent views and vistas that are enjoyed by millions of visitors. The following are internationally and nationally significant features, some that are seen, and others that are unseen, hidden below the surface in the nearshore environment. In a marine sanctuary, a core area is usually an internationally or nationally significant ecological unit that needs primary protection and becomes the central focus of a sanctuary. Vital ecosystems supporting significant marine life are clear candidates for protection. Nationally significant historical and cultural features are also nominated for protection. For example, within our proposed area of expansion, Chumash underwater archaeological sites could qualify for core area designation. Within this proposed expansion area, there are several core areas. This article will focus on Core Area One, which is arguably the most important unprotected oceanographic complex feature along the California coast. As we work toward establishing a Marine Sanctuary on our central coast, some background history will provide a context for the potential benefits and safeguards a Marine Sanctuary could provide. Our hearts, minds, and prayers go out to the residents of the Gulf Coast who suffer due to the blowout gusher in the Gulf of Mexico. We are also heartbroken over the environmental damage occurring and will continue to occur for years to come. We know this heartache from direct experience. San Luis Obispo County is a coastal economy and home to many who depend on the ocean’s resources. As we watch the loss of livelihoods and destruction of coastal waters and marine life caused by the Deepwater Horizon oil disaster in the Gulf of Mexico, we need to take action to protect ourselves and our coastal waters. According to the National Oceanic and Atmospheric Administration, (NOAA), “National Marine Sanctuaries are unique places addressing key issues facing our world – one special place at a time. Marine sanctuaries are helping to create a new paradigm, one that encourages a change in behavior. Even though there isn’t a national sanctuary protecting most of San Luis Obispo County’s coastal waters, Morro Bay fisheries are doing a great job of working with the sustainable fisheries program set up by the Nature Conservancy. The Conservancy, California Fisheries Fund, and FishWise are helping to support Central Coast fisheries and fishing communities by reaching out to consumers who care about fresh fish, want local sustainable seafood and have a desire grow their businesses. Go to California Fisheries Fund to learn more about some of the innovative fishermen and fishing businesses in Morro Bay.